So an SSD with a 6Gbps SATA 3.0 interface just isn’t fast enough for you. You speed freak. I kid. Faster is always better when it comes to storage, and until loads are instantaneous, you’ll never hear the phrase “it’s fast enough” escape my lips. 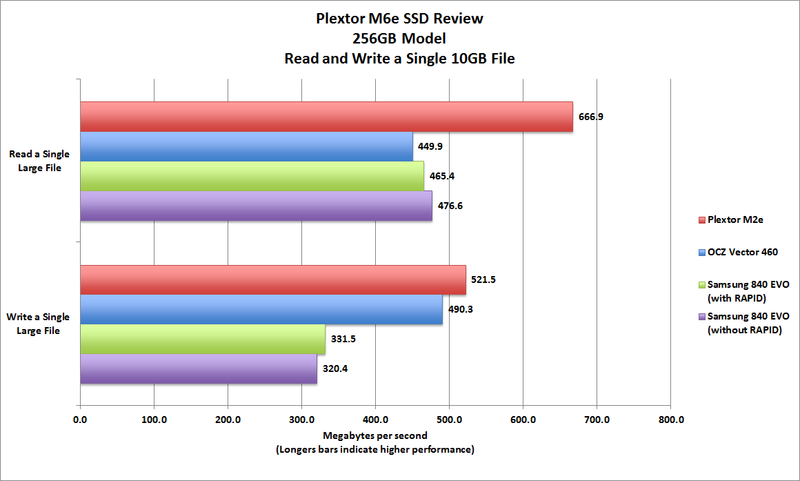 That’s why I poached Plextor’s M6e PCIe SSD to kick around on my home system. After it set records during a reconnoiter by PCWorld’s esteemed test center, that is. The Plextor M6e is an M.2 SSD mounted on a x2 PCIe 2.0 card. The M6e isn’t a traditional hard-wired NAND-on-a-card PCIe SSD that requires a driver, and it’s not a 2.5-inch SATA SSD mounted on a PCIe card, like the Apricorn Velocity Solo X2 we reviewed a while back. It’s a three-inch long M.2 SSD mounted on a x2 PCIe 2.0 adapter card. M.2 is a NGFF (Next Generation Form Factor) socket that supports storage via either SATA 3.0 or PCIe 3.0. Theoretically, you could get 1GBps (500MBps per lane) out of this type of arrangement. You won’t, because SSDs aren’t currently that fast, but you will get better performance than what a SATA 3.0 device can deliver. The M6e uses a dual-core Marvell 88SS9183 controller and has 512MB of DRAM cache on board--that latter is primarily responsible for its record-setting performance. We installed the drive in one of the PCIe 3.0 x16 slots in an Asus Z87 Expert motherboard, with an Intel Core i7-4770K CPU and 32GB of DDR3/16000 memory, which is the same rig we use for all our storage testing. The M6e plugs into a motherboard’s PCIe 3.0 slot (x2 or higher), as shown in this photo provided by the manufacturer. The M6e turned in superior numbers: 667MBps reading our single 10GB file, and 509MBps reading our 10GB mix of files and folders (in our tests, the files are read from a super-fast RAM drive to eliminate any bottleneck). That’s 170- and 100MBps faster respectively than any 2.5-inch SATA SSD we’ve tested. 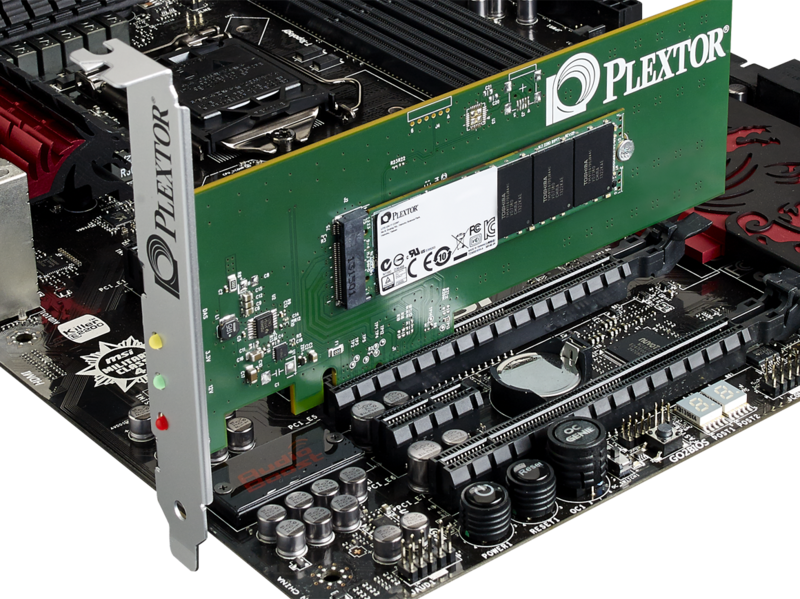 Plextor’s M6e is capable of blazing-fast read speeds, and excellent write speeds. It was also very fast writing the single large file—521MBps—but that’s only about 10MBps faster than the closest SATA SSDs. 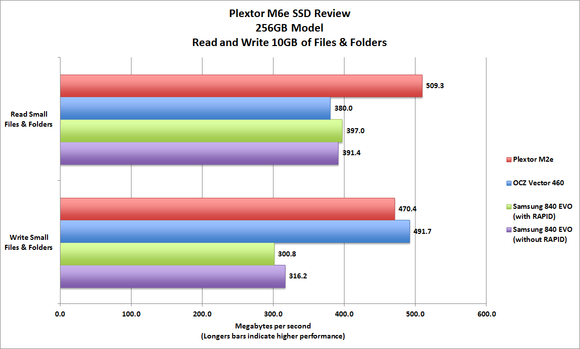 Reading the mix of small files and folders at 470MBps, on the other hand, left the M6e in 7th place among all SSDs. Boo hoo: Superlative read speeds and merely excellent write speeds. The drive is also no slouch when it comes to handling large files. Not to curb your enthusiasm, but the boost in performance does cost you a bit extra. The 128GB version of the M6e costs $180, the 256GB version we tested costs $300, and the 512GB version is $550, although Plextor says you should see discounts from online sellers. The premium price is warranted given the performance: There’s a marked difference between the M6e and a fast 2.5-inch SATA SSD. 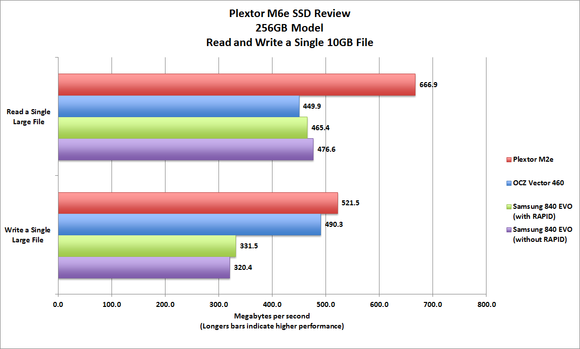 The performance delta between top-shelf SATA SSDs is negligible. 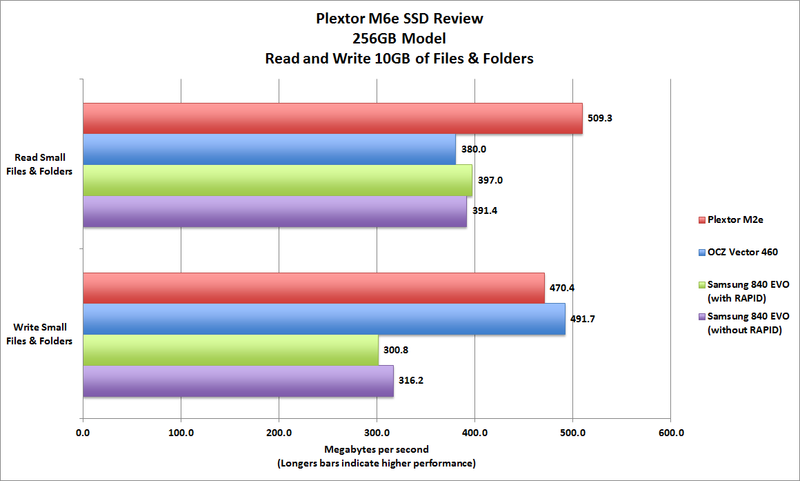 So here’s the scoop: If you want a really fast, relatively affordable SSD for your PC, the Plextor M6e is it. Kudos to the company for getting there first. Note: This article was edited on 8/14/2015 for accuracy and clarity. 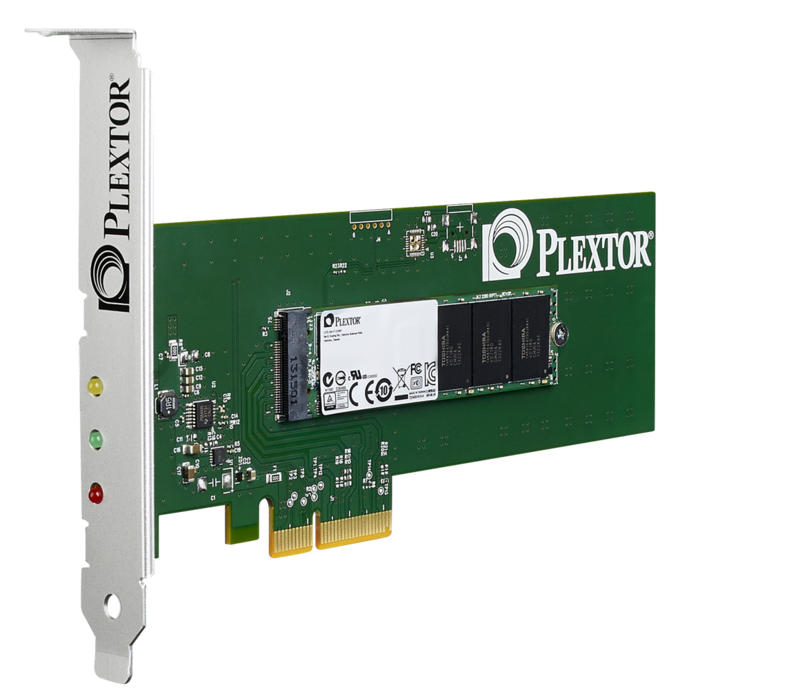 For a price tag that's just a little higher than an SSD with a SATA 3.0 interface, Plextor's M6e delivers a 20-percent jump in read performance.